The story of the Magi, or the three kings, is a celebrated part of the Christmas story and a popular motif in Western culture. The story can be found in the Gospel of Matthew, though most details of the Magi’s visit derive from a more obscure fourteenth-century source known as the Historia Trium Regum. Matthew’s gospel describes the mysterious star of Bethlehem; the arrival of “wise men from the East”; the Magi’s reception with King Herod; the Magi’s visit to the infant Jesus; their gifts of gold, frankincense, and myrrh; and the warning the wise men received to return home by another way.1 Other details, however, are omitted from Matthew’s Christmas tale. Exactly how many wise men arrived from the East? Who were they? What were their names? And what happened to them after they returned from Bethlehem? Ultimately, although clearly outside the scope of Matthew’s gospel, how did the bodies of the three kings come to be laid to rest in Cologne, Germany? Window of the Adoration of the Magi, stained glass (1846), Cologne Cathedral (Kölner Dom), Cologne, Germany. The Adoration Window actually combines two events related to the birth of Jesus: the Adoration of the Magi and the Adoration of the Shepherds. John of Hildesheim may have thought he had had the last word on the three kings, but the Shrine of the Three Kings at Cologne Cathedral (pictured above) and the precious relics it purportedly contains has continued to fascinate modern visitors.15 Are the bones sealed in the reliquary really those of Melchior, Balthazar, and Jasper? Mosaic of the Magi, Basilica di Sant’Apollinare Nuovo, Ravenna, Italy. Courtesy of Nina Aldin Thune, Wikimedia Commons. In 2004, Egyptologist Bob Brier and The Learning Channel examined whether the bones in the Shrine of the Three Kings could possibly be the bones of the Magi, and their investigation revealed something remarkable.17 Scrutinizing the cranial sutures of the three skulls kept in the shrine, Brier’s team concluded that the skulls appeared to be from individuals of different ages: one older (the sutures were completely fused), one middle-aged (the sutures were mostly fused), and one younger (the sutures were incompletely fused). The relative ages of the skulls appeared to corroborate the depiction of the Magi in the Ravenna mosaic. For those who have visited Cologne Cathedral, the impressive and stately Shrine of the Three Kings serves as a visual reminder of events that transpired over two thousand years ago, when three men left the comfort of their homes to worship at the feet of an infant. Pope Saint Leo, writing in the fifth century, helps keep the meaning of their visit in perspective: “When a star had conducted them to worship Jesus, they did not find Him commanding devils or raising the dead or restoring sight to the blind or speech to the dumb, or employed in any divine action; but a silent babe, dependent upon a mother’s care, giving no sign of power but exhibiting a miracle of humility.”19 In the din of our modern world, this message of hope and faith may strike some as something of an epiphany. To all our readers, we wish you a merry Christmas and a joyous and safe holiday season. We hope to see you back in 2014 and look forward to sharing further posts with you at Reliquarian.com in the new year. Die Heiligen Drei Könige (The Three Holy Kings), oak (originally polychromed) (1490), Nuremberg, Germany. 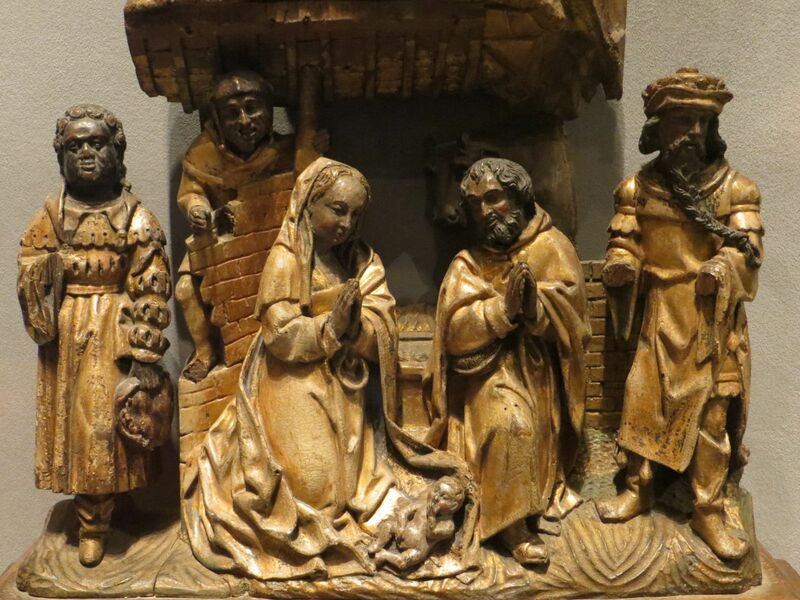 These figures are rare examples of Dutch medieval sculpture and were originally displayed on the pillars of a church, along with the Virgin Mary. The physiognomy and lively pose of the sculpture on the left identify him as King Balthazar, who is often depicted as a dark complexioned, “exotic” figure from either Africa or Arabia. Poklon Trzech Króli (Adoration of the Magi) (detail), painted wood (c. 1450-1475), Archdiocesan Musem, Krakow, Poland. This sculpture was originally displayed in Saint Mary’s Church in Krakow and was probably the central scene of a lost triptych. According to the Archdiocesan Museum, it is an example of the “angular” late Gothic style of sculpture in Krakow that preceded the later, more “expressive” work of Wit Stwosz (Veit Stoss). See Andrzej Jozef Nowobilski, Origin Collection Activity 70 (2011). Adoration of the Magi (detail), oak with paint and gilding, South Netherlandish (1520), Metropolitan Museum of Art, New York. Shrine of the Three Kings, Cologne Cathedral, Cologne, Germany. During the Middle Ages, the shrine was kept in the crossing. Today, it is displayed above the high altar, at the rear of the inner choir. 2 See The Early English Text Society, The Three Kings of Cologne: An Early English Translation of the “Historia Trium Regum” by John of Hildesheim (C. Horstmann ed., 1886); Steph Mineart, The Three Kings of Cologne—A Legend of the Middle Ages, CommonPlaceBook.com (Mar. 3, 2004), http://commonplacebook.com/culture/the_three_kings/ (featuring a modernized translation of the story by H.S. Morris). John of Hildesheim was a Carmelite friar who lived in the Prince-Bishopric of Hildesheim in what is not present-day Germany. 4 The Three Kings of Cologne—A Legend of the Middle Ages, supra note 2. 5 Id. The Hill of Vaws is also known as the Hill of Victory. 10 George Ferguson, Signs and Symbols in Christian Art 78 (1961). The Feast of the Epiphany was traditionally celebrated on January 6th, the twelfth day of Christmas. 11 The Three Kings of Cologne—A Legend of the Middle Ages, supra note 2. 13 Mark Rose, “The Three Kings & the Star,” Archeology, Dec. 21, 2004, available at http://archive.archaeology.org/online/reviews/threekings/. 14 The Three Kings of Cologne—A Legend of the Middle Ages, supra note 2. 15 See Der Kölner Dom, http://www.koelner-dom.de/ (last visited Dec. 21, 2013) (official website of Cologne Cathedral). 16 Ferguson, supra note 10, at 78. As George Ferguson points out in Signs and Symbols in Christian Art, the three gifts apparently hold a symbolic meaning: “gold to a King, frankincense to One Divine, myrrh, the emblem of death, to a Sufferer.” These gifts “represent the offering to Christ of wealth and energy, adoration, and self-sacrifice.” Id. 17 Mummy Detective: The Three Kings (The Learning Channel television broadcast Dec. 23, 2004); see also Rose, supra note 13. 18 Gerald J. Brault, Early Blazon: Heraldic Terminology in the Twelfth and Thirteenth Centuries with Special Reference to Arthurian Heraldry 45 (2nd ed. 1997). The eleven black “tears” on the escutcheon of the coat arms, more formally known as gouttes of tar, have come to represent Saint Ursula (Cologne’s other patron saint) and the eleven thousand virgins with whom she was martyred. In reality, they are likely representations of the black spots commonly found on ermine fur. See Cologne Coat of Arms, Cologne Tourist Board, http://www.cologne-tourism.com/attractions-culture/city-history/coat-of-arms.html. 19 See 1 Butler’s Lives of the Saints 40 (Herbert J. Thurston, S.J. & Donald Attwater eds., 2d ed. 1956). The reliquary pictured above purportedly contains the skulls of Saints Cosmas and Damian, twin brothers who were martyred in Cyrrhus, Syria, around the 4th century. The Rhenish School-style reliquary, which dates to 1400, is currently located at Saint Michael’s Church in Munich, Germany. The lower portion of the reliquary, which is decorated with standing figures, contains two doors that open to display the saints’ skulls. Saints Cosmas and Damian are explicitly invoked in the Canon of the Mass and are included in the Litany of the Saints and the Roman Martyrology. In The Holy Sacrifice of the Mass, first published in 1902, Nikolaus Gihr notes that in the Roman Canon, “only martyrs are named before and after the Consecration: this distinction is justly due to them. They have merited it by the bloody sacrifice of their life; . . .” Their younger brothers Anthimus, Leontius, and Euprepius, who also died during the Diocletian persecution, are memorialized in the Roman Martyrology as well. In addition to being patrons of doctors, Saints Cosmas and Damian are also patron saints of nurses, surgeons, pharmacists, dentists, barbers, and oddly (at least according to Butler), confectioners. The feast day of the saints, which had been celebrated on 27 September, was moved to 26 September to accommodate the feast of Saint Vincent de Paul. In addition to Saint Michael’s Church in Munich, the convent of the Clares in Madrid and Saint Stephen’s Cathedral in Vienna also lay claim to possessing the skulls of the twin saints. Other relics of Saints Cosmas and Damian are apparently kept at the Church of San Giorgio Maggiore in Venice.